Three-dimensional thinking was what was created by the dyslexia problem. I could design these things in my head. 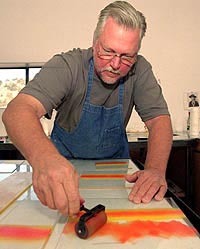 Bennett B. Strahan is an accomplished visual artist and architect. His dyslexia was so severe as a child that he really did see print backwards. He was considered borderline retarded, and he held books up to mirrors to learn to read. Strahan’s uncle taught him to visualize the back side of letters and words so he could read.